Need some weight watchers recipes? 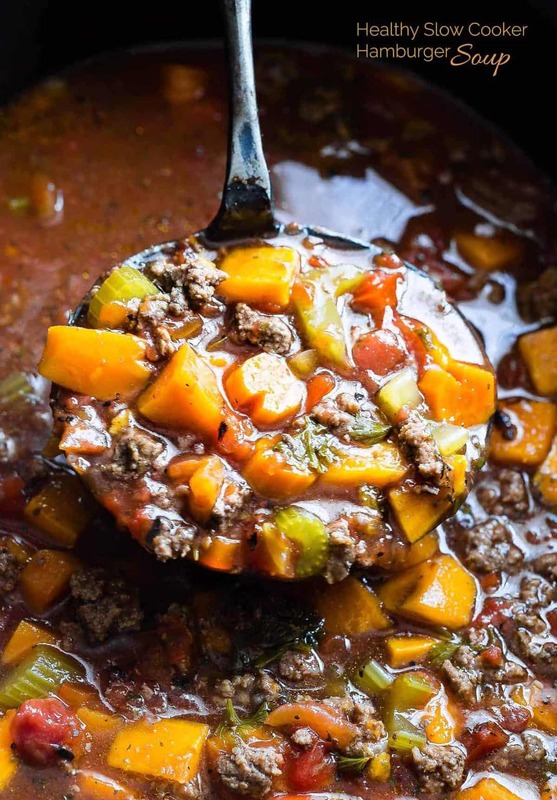 All 40 of these weight watchers smart points recipes only have 5 points or less! Recipes from breakfast through dessert! Weight Watchers recipes with points! I’ve been giving these for quite some time on the blog, and you’ve been loving them! I get a fair number of e-mails with requests for weight watchers meals with few SmartPoints. Now, as you know I personally am trying to NOT count anything – points, macros, calories, WHATEVER and I DO think it’s something that many people should try to avoid (counting that is) as I believe in trying to live balanced and not “food crazy.” BUT, I do not want to push my lifestyle on you and know that it isn’t realistic for some folks! 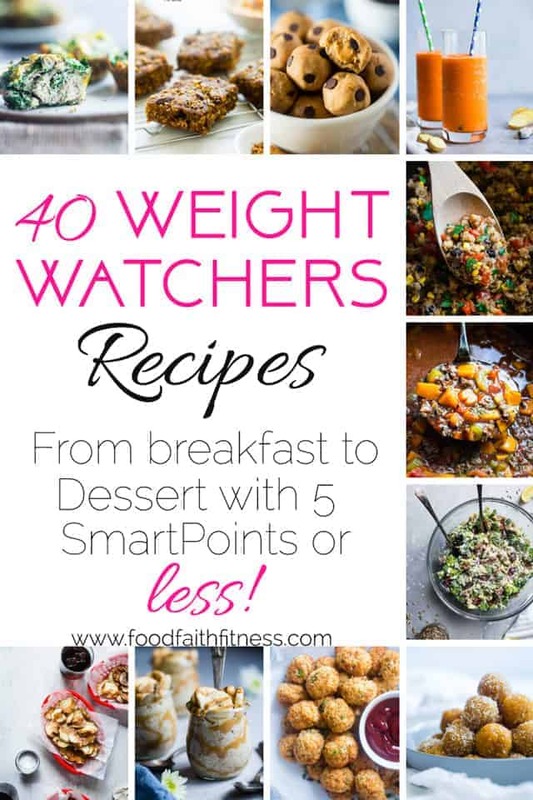 Since many of you follower Weight Watchers, I thought I would give you 40 Weight Watchers Smart Points Recipes with 5 or less Smart Points! We’re talking smartpoints recipes from breakfast to dinner, to snack, to dessert and even some side dishes! Simple click the link to the recipe and scroll down to where the recipe is (or click “jump to recipe” at the top of the page!) and you’ll see the nutritional information, along with all the points calculations! I DO use the official Weight Watchers points calculator (I pay for an account to do this for you!) so they should be pretty accurate! 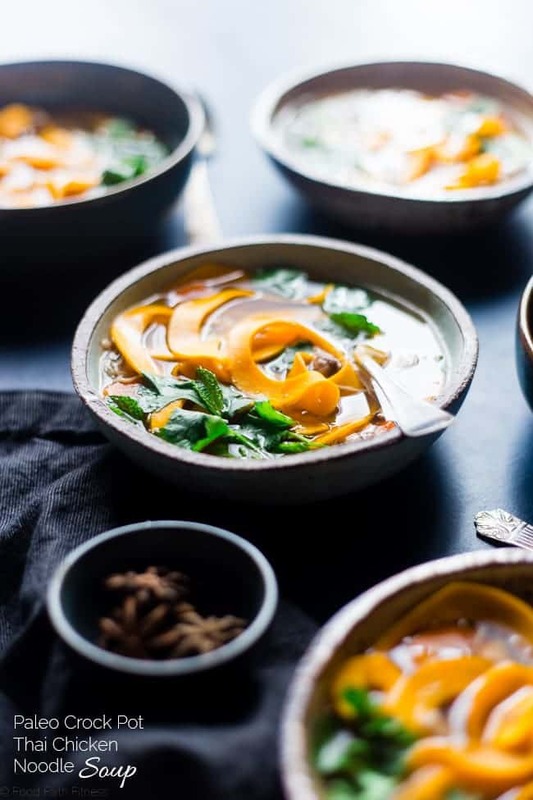 But please note that recipes can vary slightly sometimes based off the specific ingredient/brand you use, so always best to double check if you’d like to know FOR CERTAIN. Let’s get onto the recipes! 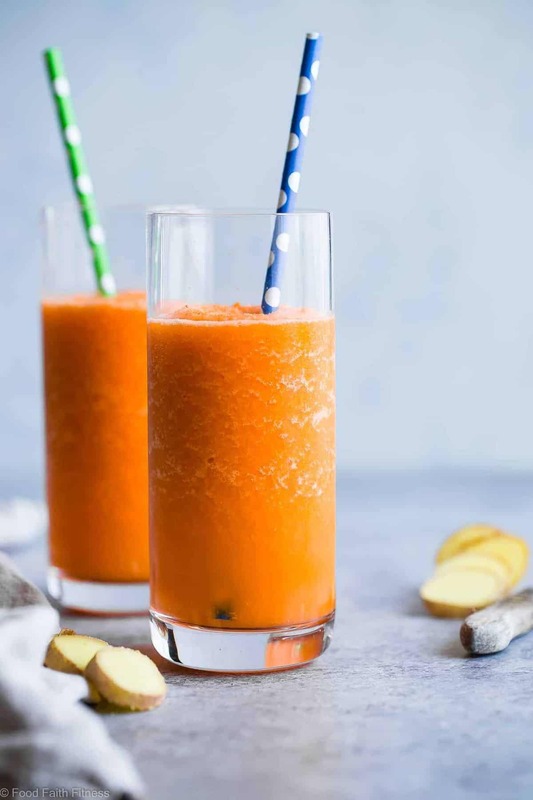 This 3 ingredient Orange Carrot Smoothie with Ginger is only 100 calories and SO refreshing! A paleo, vegan and whole30 quick breakfast or snack to get you through the day! 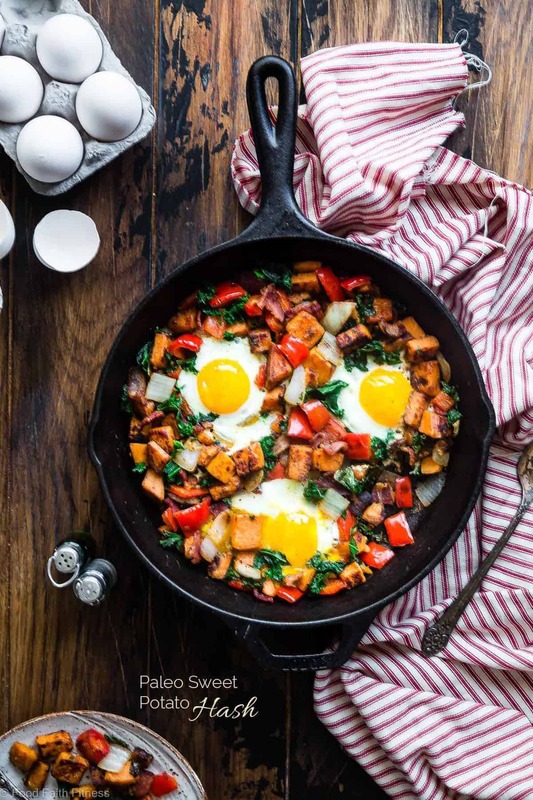 This Healthy Paleo Sweet Potato Breakfast Hash with bacon and a fried egg makes a quick, delicious and healthy breakfast that is gluten/grain/dairy/sugar free and whole30! 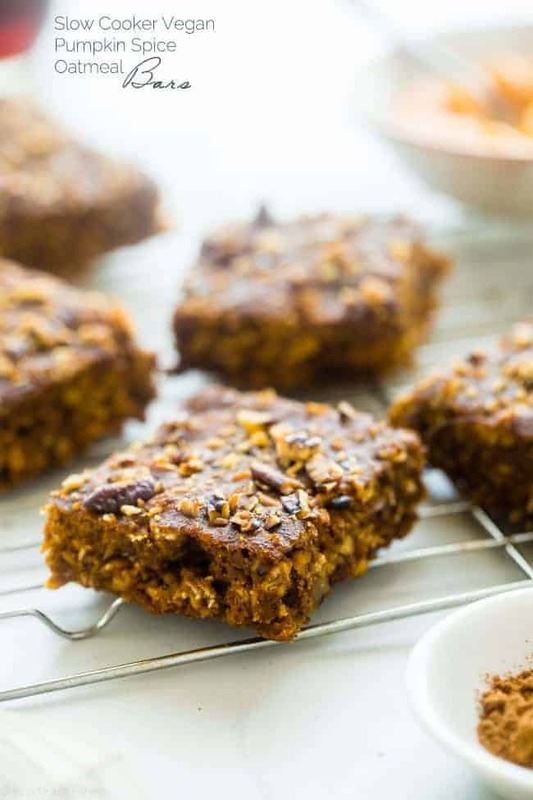 These vegan pumpkin oatmeal breakfast bars bring the spicy-sweet flavors of fall to your morning! Make them in the slow cooker for a healthy, gluten free, and portable breakfast that’s only 110 calories and 4 SmartPoints! 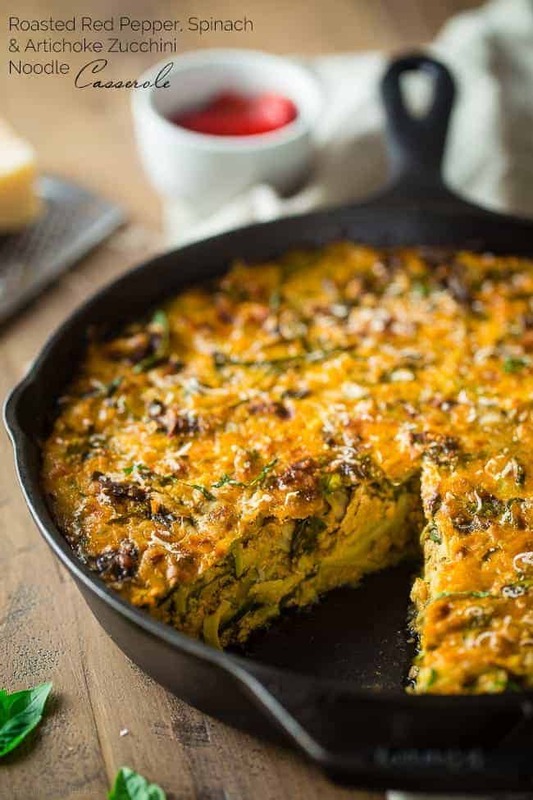 This healthy gluten free paleo breakfast casserole is an easy, whole30 compliant breakfast or brunch with a little taste of the Middle East! 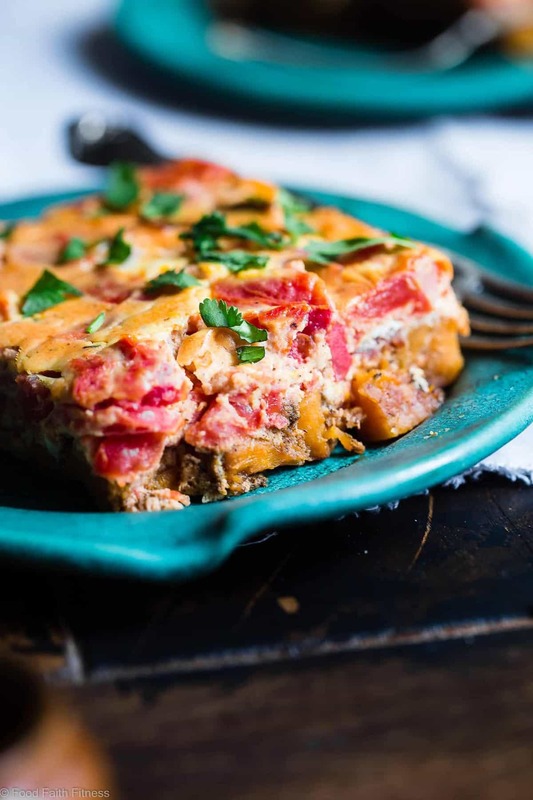 A paleo egg bake that is gluten/grain/dairy/sugar free and delicious! 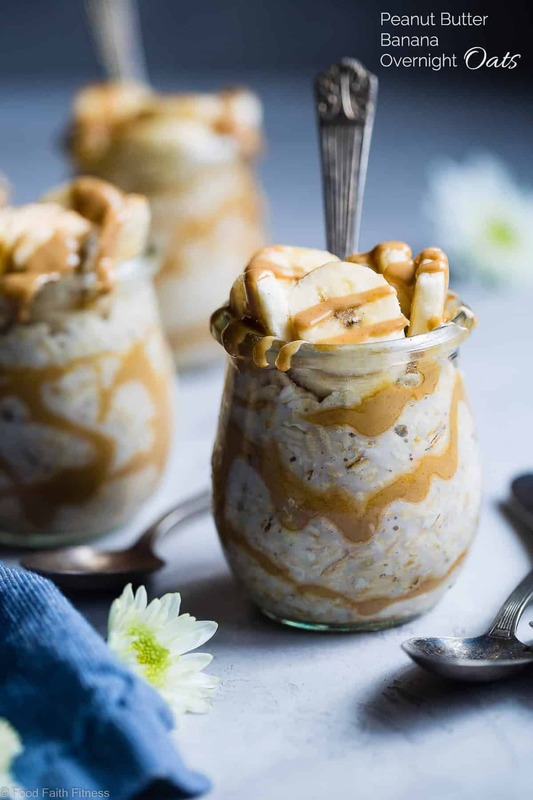 This make ahead banana peanut butter overnight oats recipe with almond milk is a healthy, 4 ingredient way to start the day! Vegan, gluten free and kid friendly too! 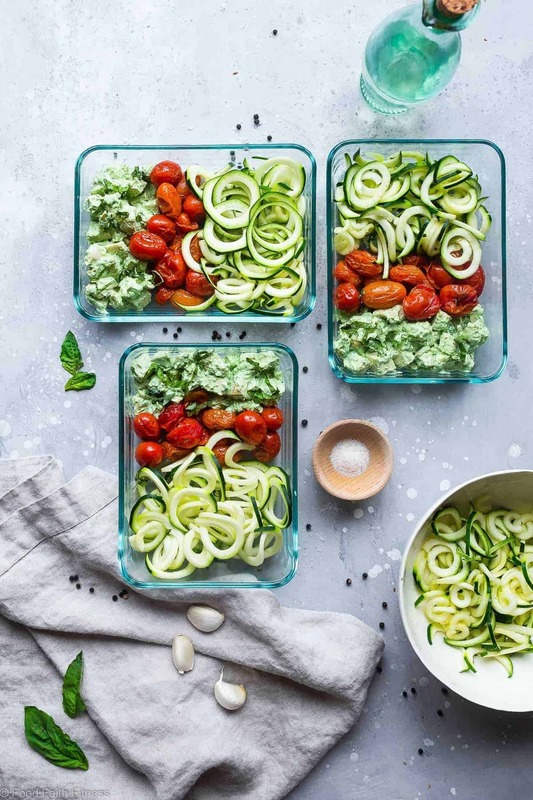 This spiralized zucchini casserole is packed with protein and is a low carb and gluten free breakfast or dinner that is under 150 calories! Spinach and artichokes keep it light and healthy! 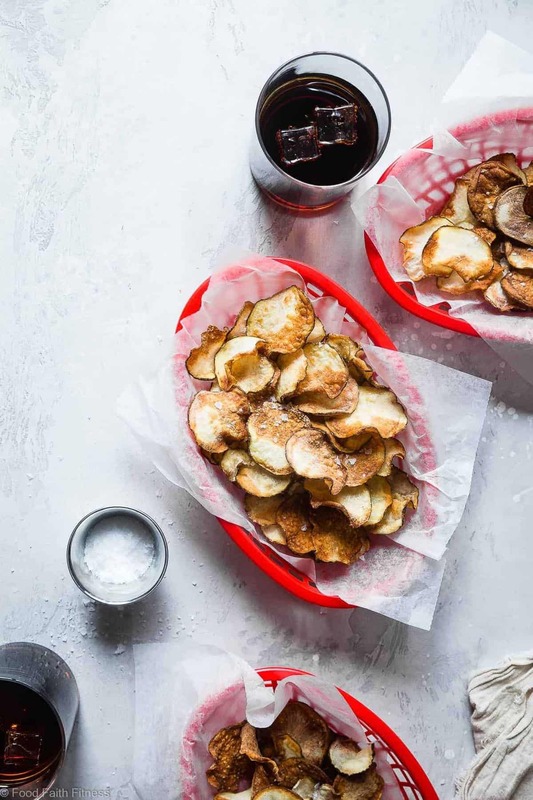 These EASY Air Fryer Potato Chips are perfectly crispy and crunchy and only use 2 ingredients! You’ll never believe they are healthy and only 75 calories for a large serving! 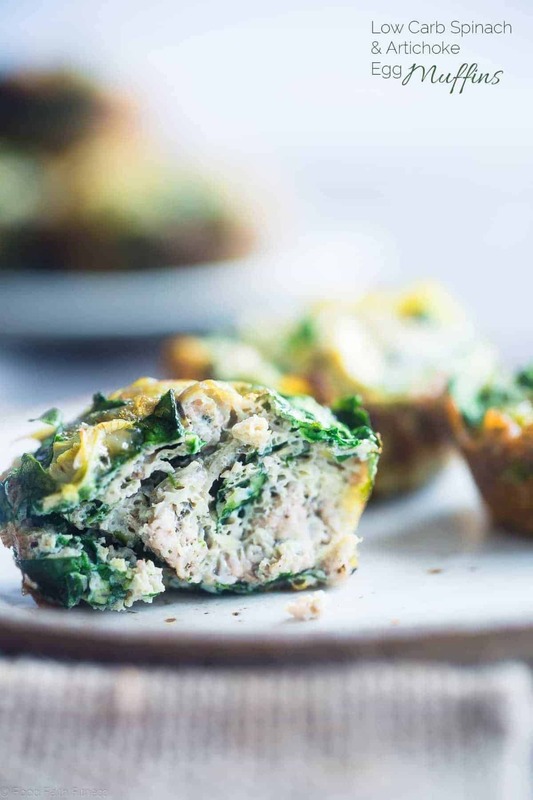 These easy, 6 ingredient paleo spinach breakfast egg muffins are low carb, gluten free, whole30 compliant and under 100 calories! Perfect for busy mornings! 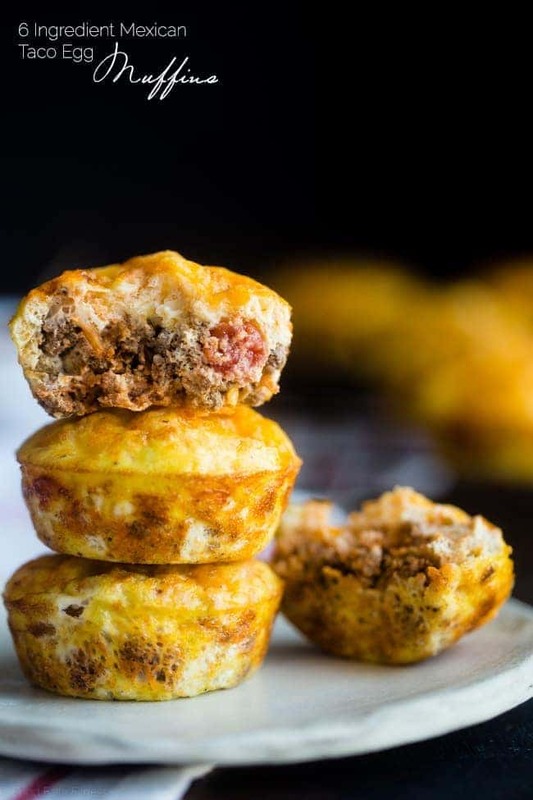 These 6-ingredient, kid-friendly taco breakfast egg muffins have all the Mexican taste without the carbs! They’re an easy, healthy, gluten free and protein packed portable breakfast for busy mornings with only 105 calories! 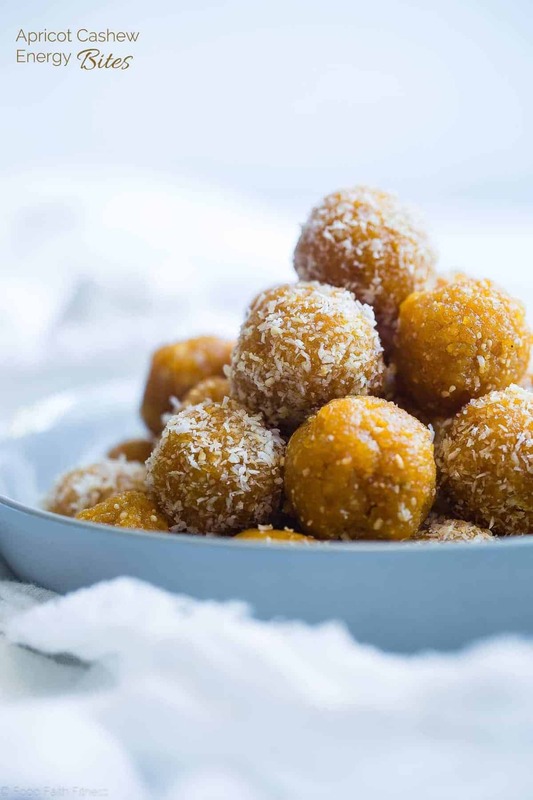 These 3 ingredient apricot cashew no bake energy bites are a quick and easy, healthy snack for busy days! Gluten free and paleo and vegan friendly too! 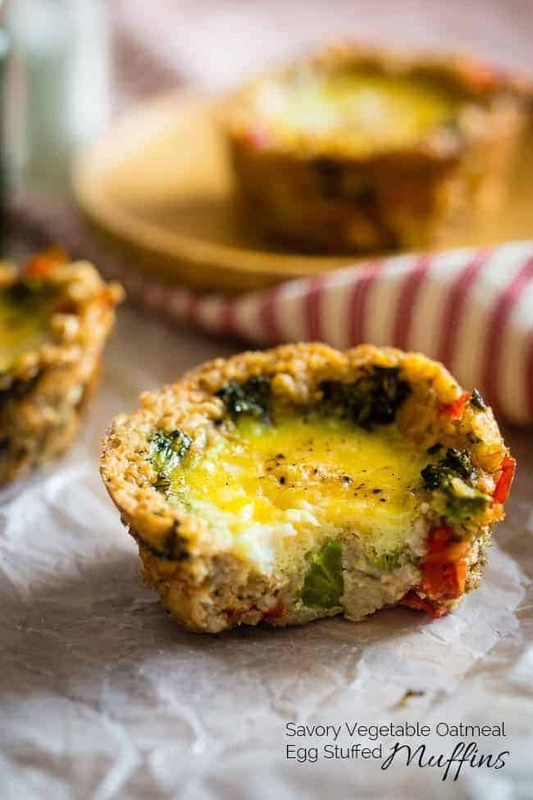 These quick and easy egg muffins have a vegetable and savory oatmeal crust! They’re a healthy and gluten free portable snack or breakfast for busy mornings, with only 80 calories and 2 SmartPoints! 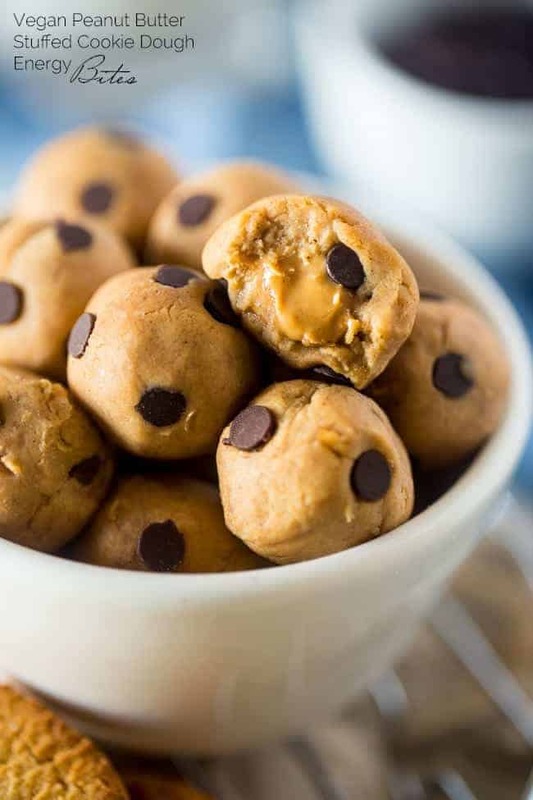 These Vegan Cookie Dough Bites are stuffed with peanut butter and are full of chocolate chips! You would never know they’re secretly healthy, gluten free and only 65 calories! 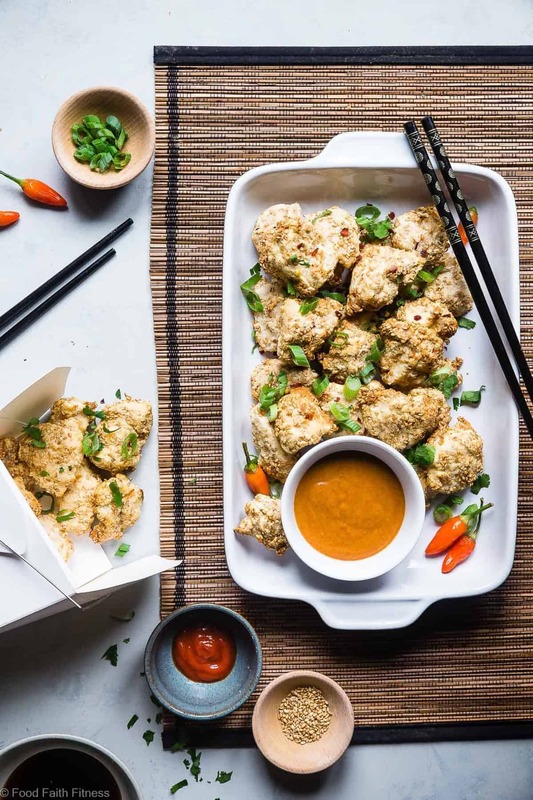 These Low Carb Keto Paleo Baked Chicken Nuggets are cooked in the air fryer and have an Asian twist! A healthy, whole30, gluten free, family-friendly weeknight dinner! Oven baked option too! These pesto chicken meal prep bowls are an easy, low carb, gluten free and protein packed lunch for work! A healthy meal for kids or adults that’s only 260 calories! 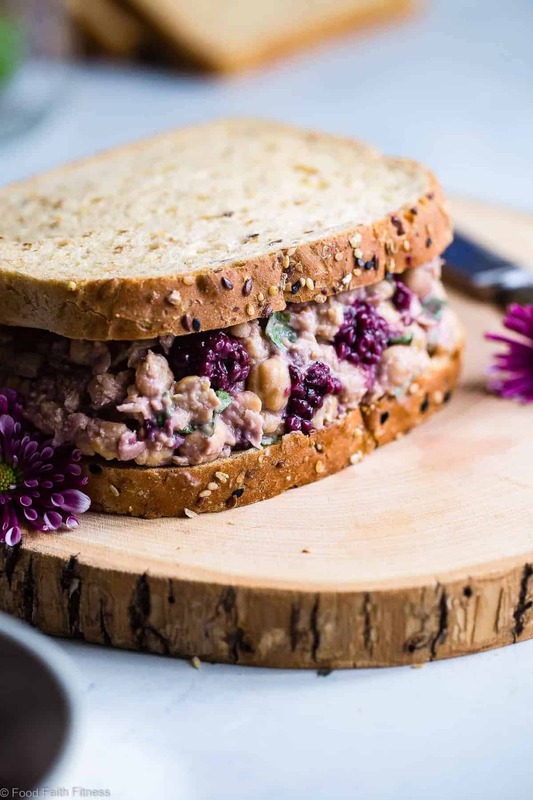 This sandwich with chickpea spread has tangy notes of balsamic vinegar, sweet blackberries and fresh basil! It’s a healthy, gluten free lunch that’s packed with plant protein and fiber! 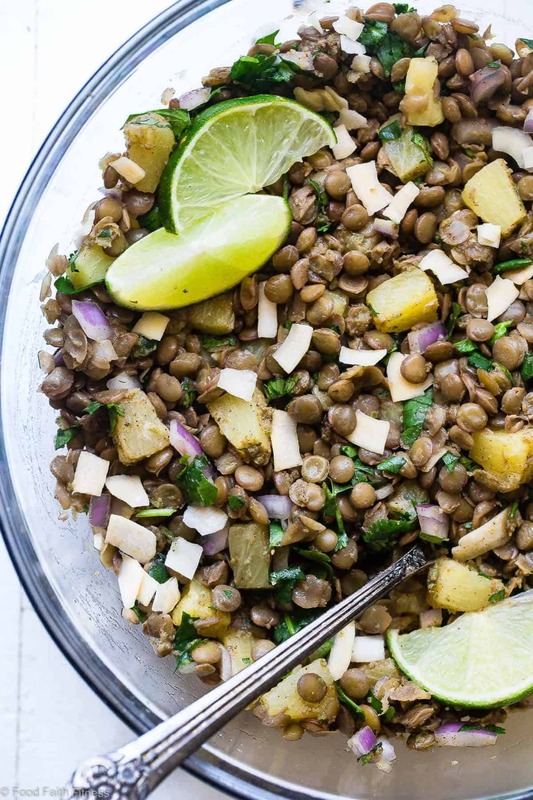 This easy, healthy lentil salad recipe has a Caribbean-inspired, tropical twist! 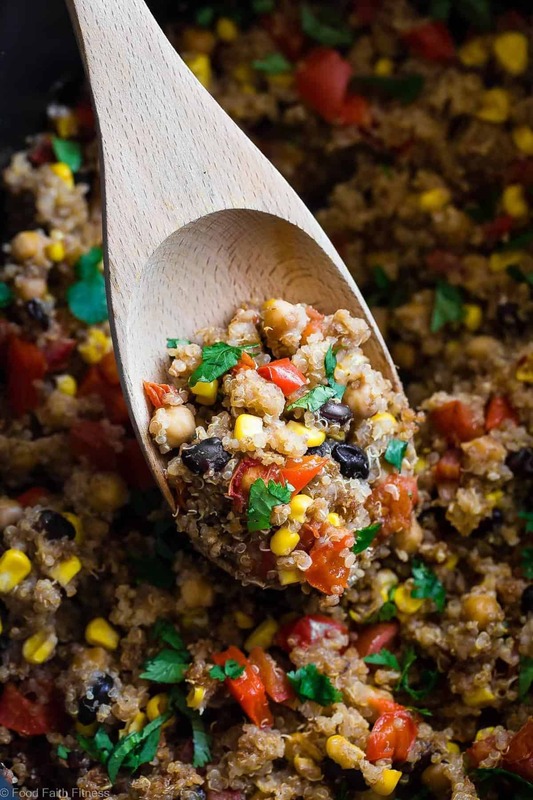 It’s a vegan-friendly, gluten free meal that’s packed with plant-based protein! 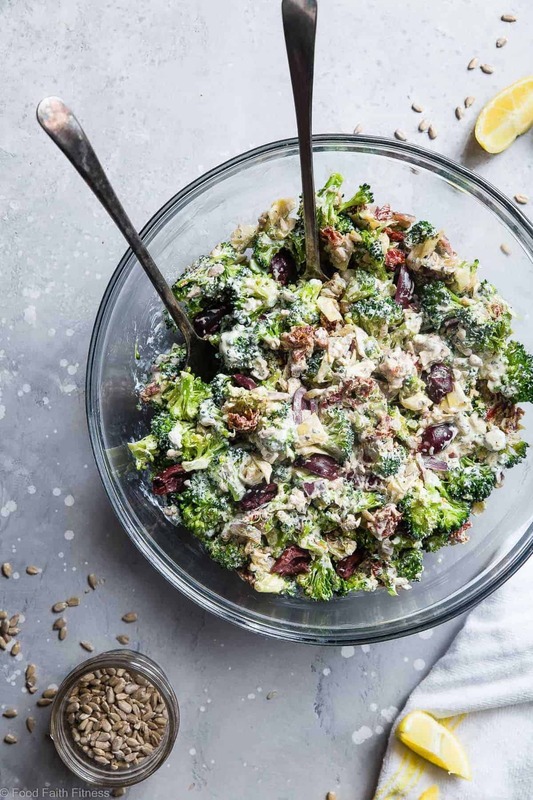 This Mediterranean Low Carb Broccoli Salad is a super easy, healthy and protein packed side dish for dinner or a potluck! It’s made with Greek yogurt and you won’t even miss the mayo! 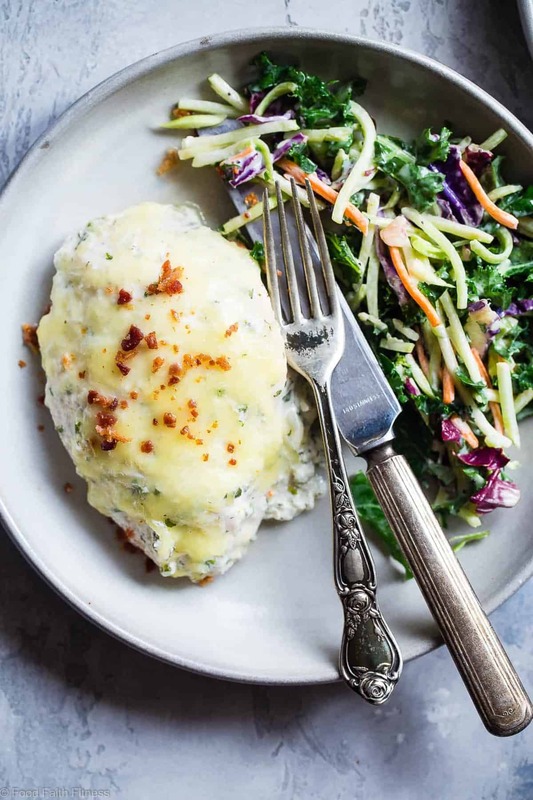 This Ranch Baked Greek Yogurt Chicken with cheese and bacon is a quick and easy weeknight meal that is healthy and delicious! A total crowd pleaser! 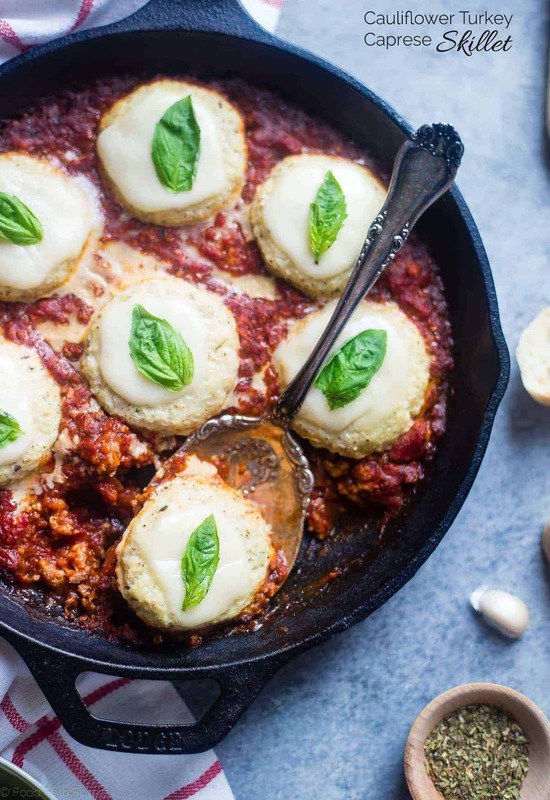 These cauliflower caprese skillet has all the Italian flavors of the classic salad, in a light, healthy and low carb dinner that everyone will love! 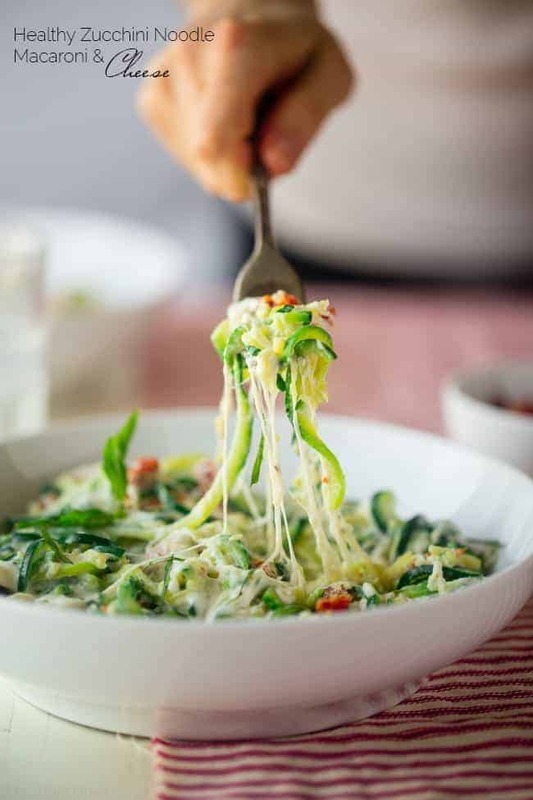 This quick and easy gluten free mac and cheese uses zucchini noodles and Greek yogurt to keep it light, healthy, low carb and protein packed! It’s the perfect healthy comfort food that’s only 250 calories! 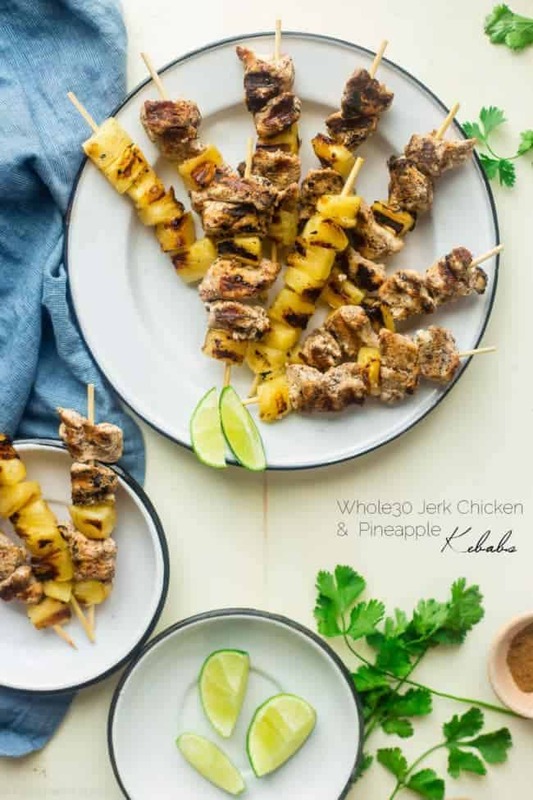 This easy jerk chicken recipe uses pineapple juice instead of sugar so it’s Whole30 compliant and paleo friendly! 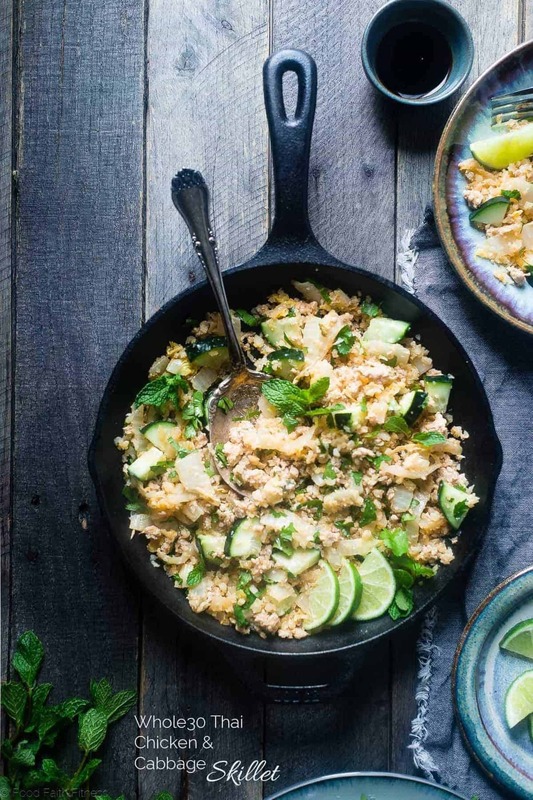 It’s a simple, flavorful weeknight meal that’s perfect for the summer! 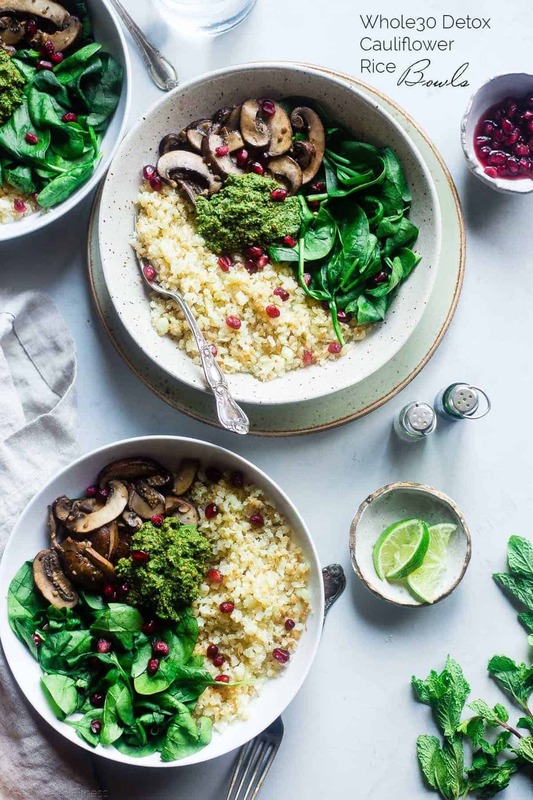 These low carb detox cauliflower mushroom bowls are packed with veggies and a delicious almond pesto! They’re a whole30 compliant, vegan and paleo friendly meal that is only 200 calories! 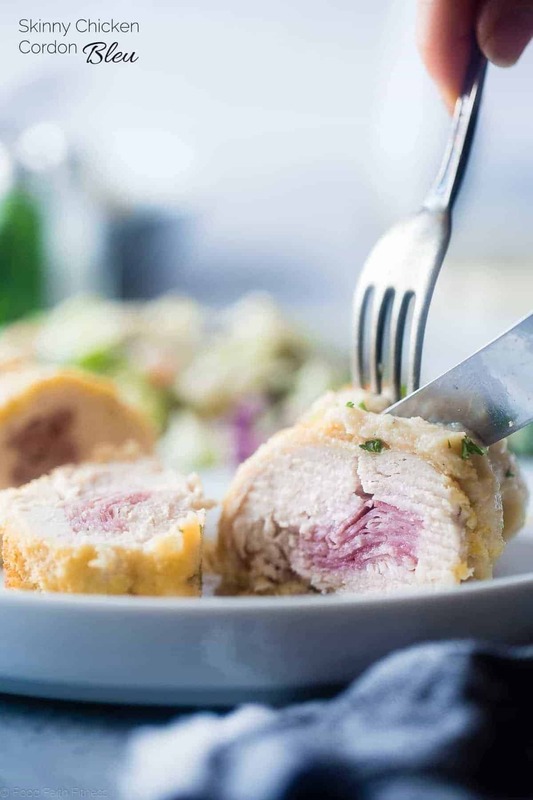 This gluten free, healthy baked chicken cordon bleu has a creamy cauliflower Alfredo sauce instead of cheese! It’s an easy, kid-friendly weeknight meal! 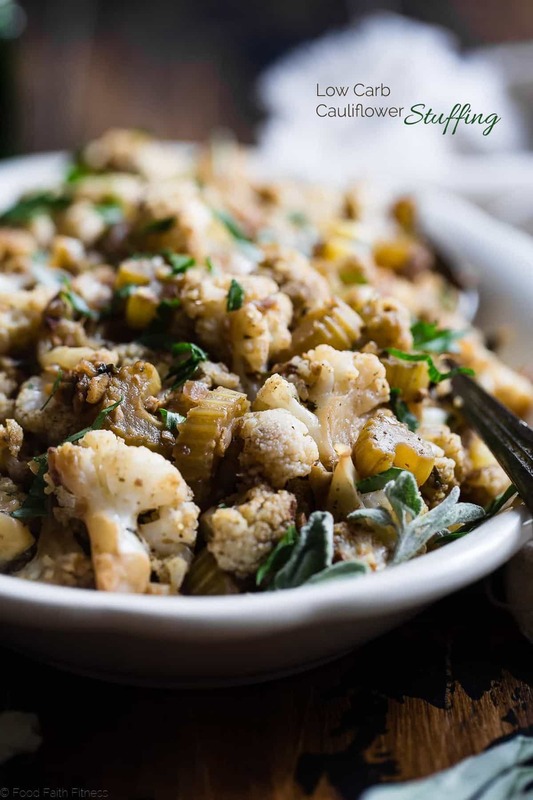 This Cauliflower Low Carb Paleo Vegan Stuffing is made entirely from vegetables but has all the flavor of traditional stuffing! Whole30, gluten free and SO delicious! 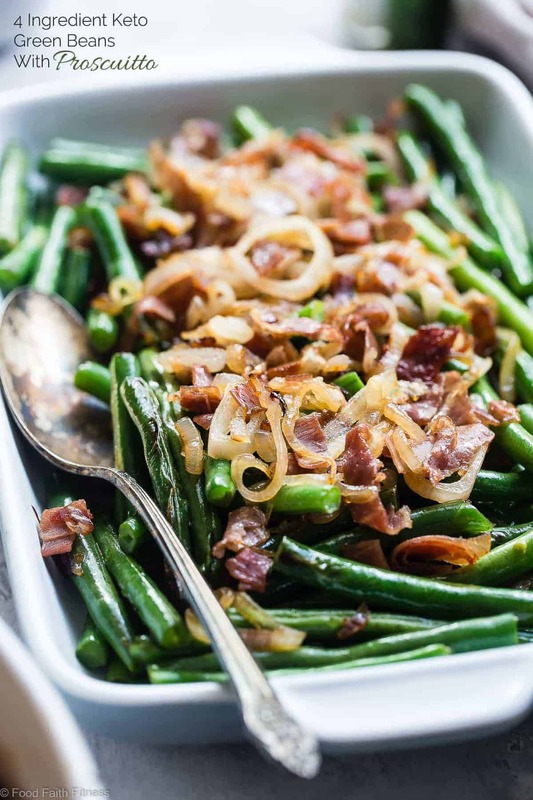 This Easy Sautéed Fresh Green Beans Recipe with Crispy Prosciutto comes together in a snap! It’s only 4 ingredients, keto and paleo friendly! 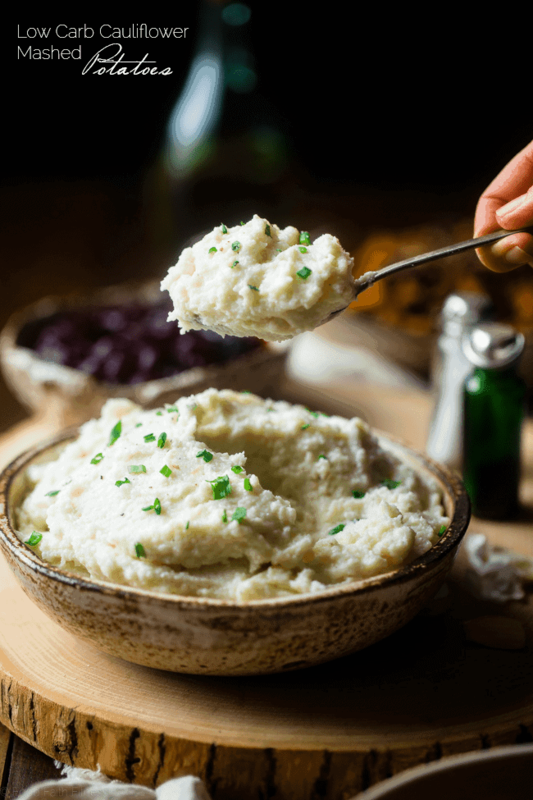 These quick and easy, low carb cauliflower mashed potatoes only have 5 ingredients, 62 calories, 1 SmartPoint and use a secret ingredient to pack them with protein! They’re perfect for a healthy Thanksgiving! 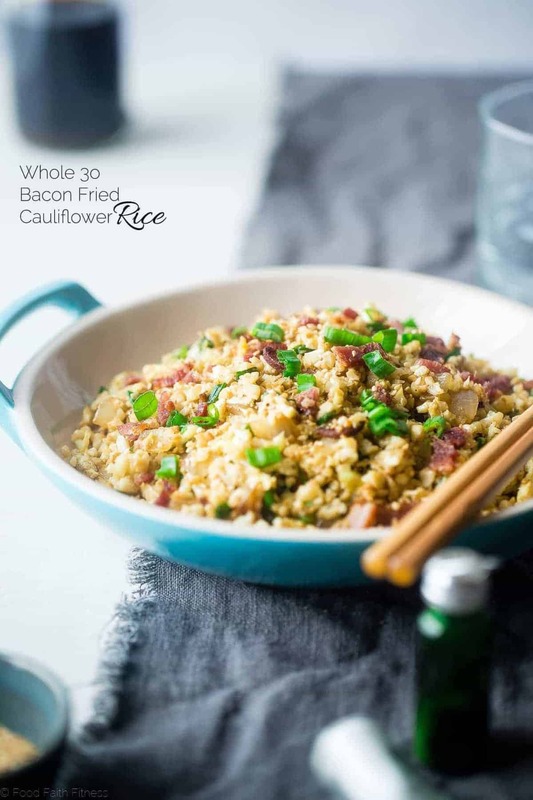 This lower carb, healthy cauliflower fried rice uses bacon instead of chicken to make it extra delicious! It’s an easy, family-friendly whole30 compliant weeknight meal for under 250 calories! 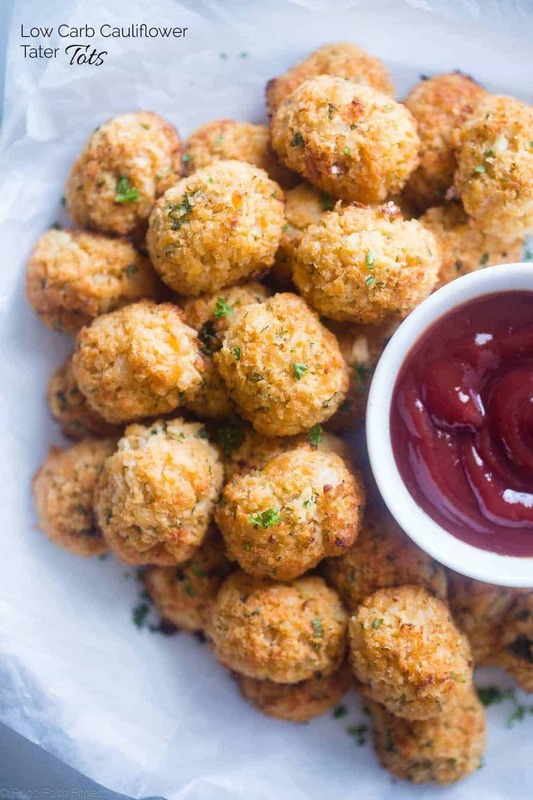 These cauliflower tater tots are a lower carb version of the classic comfort food that are crispy on the outside and soft on the inside. You’ll never know they’re healthy! 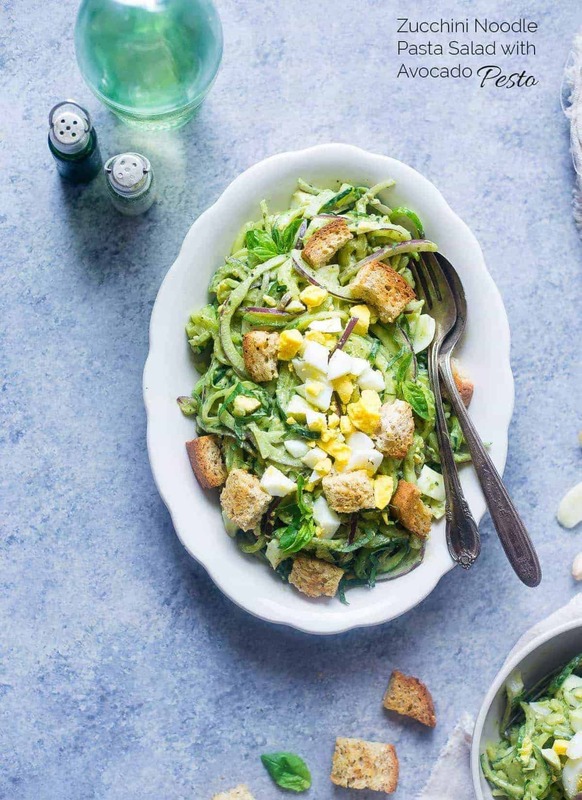 This creamy, gluten free avocado pesto healthy pasta salad uses zucchini noodles instead of pasta and has crunchy croutons! 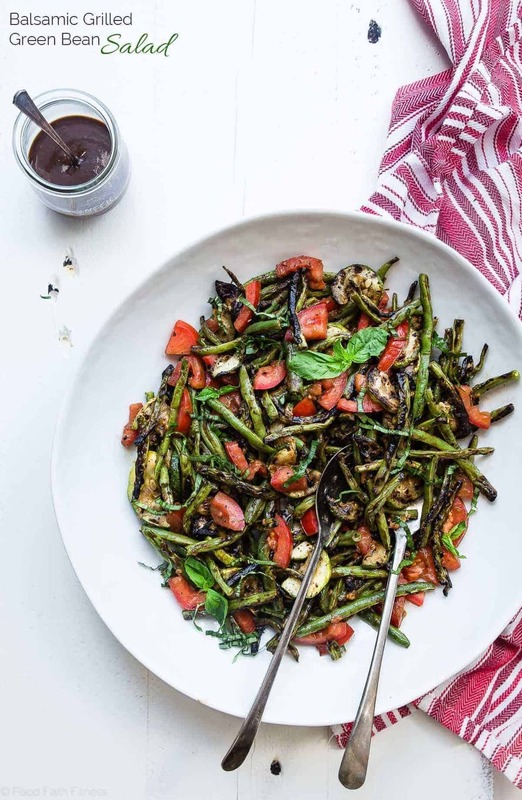 It’s a simple, low carb, easy spring side dish that’s perfect for get togethers! 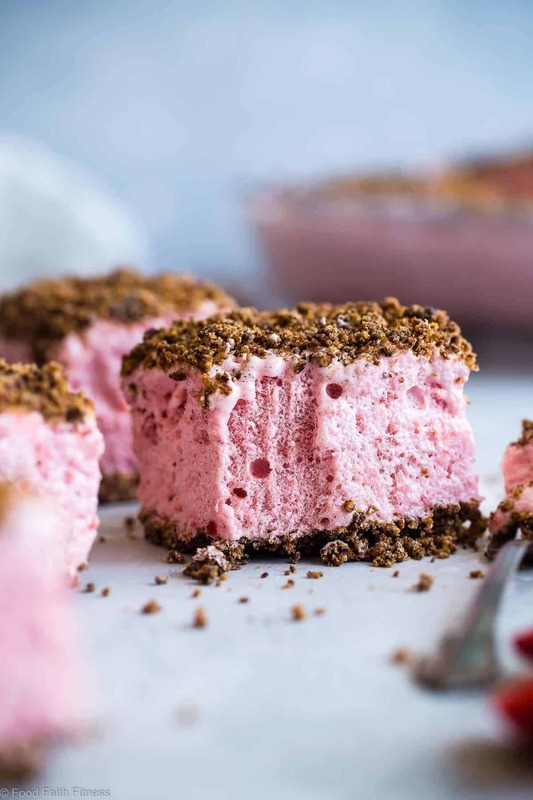 A quick and easy, refined sugar free and gluten free healthy Frozen Strawberry Dessert Recipe with a crunchy, pecan crumble! This recipe is always a hit with kids and adults! 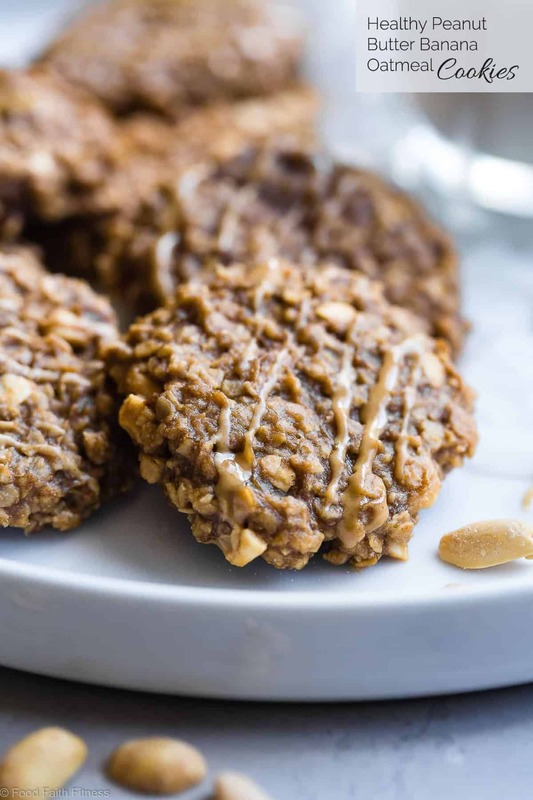 These Easy Peanut Butter Oatmeal Banana Cookies use only 5 simple ingredients and are gluten free and vegan friendly! A healthy treat for kids and adults! 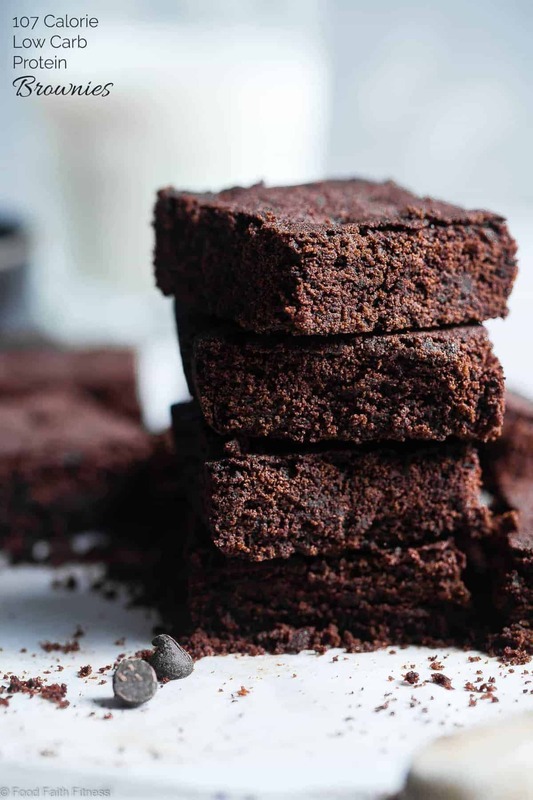 These Protein Low Carb Keto Brownies are SO dense and chewy you would never believe they are only 107 calories! Paleo friendly, sugar/gluten free and so tasty! 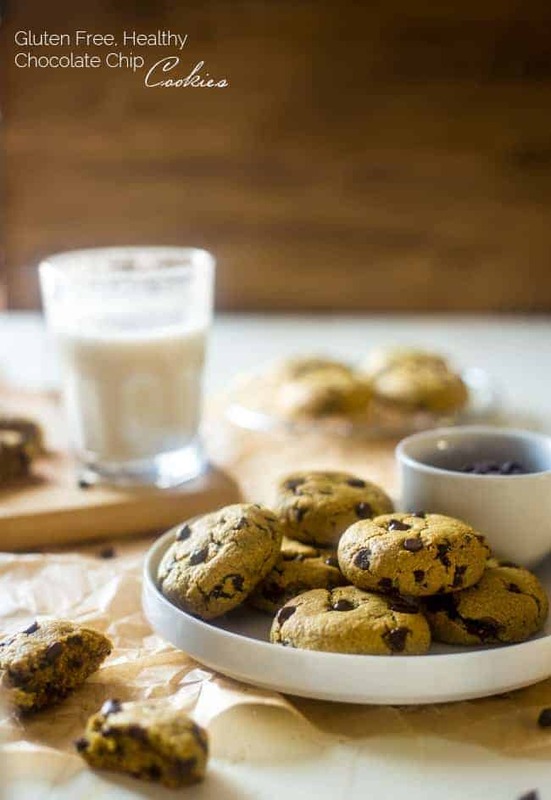 These easy healthy gluten free chocolate chip cookies are big, soft and chewy! You’d never know they are butter and oil free and use a secret ingredient to make them heart healthy, low fat and only 104 calories! 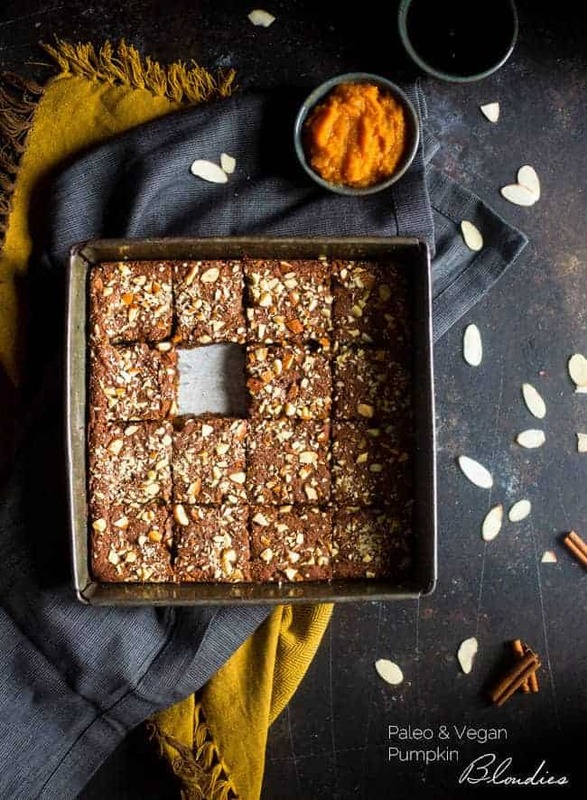 These pumpkin blondies are so dense, and sweet that you’d never know they’re a healthier treat, with no butter or oil, for only 105 calories! They’re paleo and vegan friendly too! 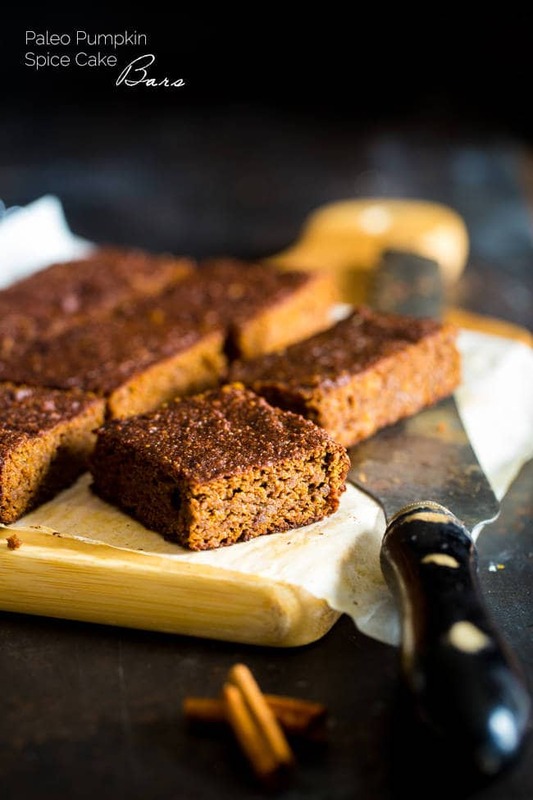 These pumpkin cake bars are made in one bowl and are secretly healthy, gluten-free, paleo friendly and only 110 calories! They’re a fall dessert that’s always a crowd pleaser! Delicious round-up of recipes! Goodness reminds me of some of your recipes I made long ago and need to make again! Avocado chocolate chip cookies, chickpea peanut butter balls, etc. I never followed Weight Watchers either. It seemed to focus a liiiiiittle too much on low calorie and low fat contents for me to find it sustainable. However, it’s wonderful that those following Weight Watchers can enjoy these recipes! The vegan pumpkin bars, peanut butter oatmeal cookies, air fryer potato chips, grilled zucchini and green bean salad, cauliflower mashed potatoes, vegan peanut butter-stuffed cookie dough bites, and banana peanut butter overnight oats look marvelous! Totally hear you on that! Thanks Cassie – I hope you can still use some of the recipes!